Around the same time we were asked to test-drive a rich, decadent cheesecake, we were also asked to try pasta from a company called Garofalo. Now, dear readers, I really hope you don’t think we would sell out and become a blog purely about taste-testing and dedicated to kissing bum to those who dare to send us free stuff. We will not ever become that type of blog. We will always be willing to try free food stuff (I stress the word free) but we will never, and I repeat NEVER say good things about something we hate. I will not lie about free food products we receive and would rather, instead, just not waste my time writing about it. But this pasta test-drive ended up being a way different experience than I thought it would be. After that kick-a$$ cheesecake we devoured I figured that free pasta would pale in comparison. Boy was I wrong. As most of you know, we prefer savory food over sweets and I’d take a big, steaming bowl of perfectly al dente pasta over a cheesecake any day. I’m serious here. Garofalo’s pappardelle from their “signature line” did the trick. We paired this fabulously tasty pasta with a hearty Sausage Ragu and it held up while adding that perfect chew to the dish. I know I go on and on (and on) about how important perfectly al dente pasta is to me, but I can’t imagine wasting a fabulous sauce on a crappy, soggy bit of pasta. Too often if you follow the instructions on the back of a box of pasta you’ll be left with it way overcooked. My rule of thumb is to always subtract two minutes from the given instructions and usually I get the perfect chew. This time I decided to test Garofalo’s (hey, it was free) to see if their instructions were bang-on. 8 minutes is what it said and 8 minutes was all it needed. Maybe they got it right because this pasta is actually made in Italy, “near the ruins of Pompeii”. It actually tastes like it is made in Italy. The other thing I love about Garofalo pasta is that they offer “different” pasta shapes besides the obvious penne, spaghetti and linguine. Some of these specialty cuts include schiaffoni (large oval-shaped noodle) and calamarata (like thick-cut calamari rings). These are the types of shapes I want to eat when I’m bored of the norm. No lie – I highly recommend this pasta, especially along with our deliciously hearty sausage ragu. In fact, I’m writing the rep from the company to ask where I can get some in Brooklyn. I have a feeling I’ll have to harass the manager at my local grocery store to order some, but it will be worth it. Saute your onions and garlic in some olive oil for a few minutes to get some color on them. Add the sausage meat and break up with a wooden spoon. Allow to brown for 2 to 3 minutes and then add the fennel seed and stir. Add in the red wine and stir into the meat. Allow to cook down for a minute. Add the whole can of tomatoes. Let this cook on medium-low and stir. It will cook for about 20-30 minutes until all the flavors come together. While the ragu comes together, boil some salted water. About ten minutes before you’re ready to eat, boil your pasta till al dente and add directly into the ragu along with a 1/4 ladel-full of pasta water. Add peas. Cook for 30 seconds, toss in some basil and plate. Serve with parmigiano reggiano. Enjoy! This really look so good, it making me hungry. Here I am sitting in bed noshing on some pretzels, hungry as hell, checking my Saturday morning post and here is this decadent pappardelle tempting me. I sadly look at my white cheddar cheez-its and curse my life. sad replacement for this yummy pasta. I agree, mushy pasta is the worst. I think that’s all I grew up eating and didn’t realize what pasta was actually supposed to taste like until I moved here to nyc. What a revelation! this may be my Sunday dinner tomorrow…..I love peas in pasta. I had them this week w/ prosciutto, pesto and tortelloni. I have had calamaretti at Scarpetta on 14th St. I had never heard of that shape of pasta before. I have been known to lie for food. I know what you mean about getting tired of the same old pasta shapes. Please don’t mistake me…I will NEVER get tired of pasta but it’s great to come across a new shape every now and then. It’s even worse when you’re shopping for whole grain…there’s about 3 varieties! This pasta really held up well to the sauce and your ragu looks delicious. That dish looks like it came right out of my Nonna’s kitchen! She used to make something just like this. I am totally craving it now! Buonissimo! I’m really interested in that pasta too. I’ll have to see if I can get it around here. It looks homemade! Oh yes, it so perfect…looks delicious! 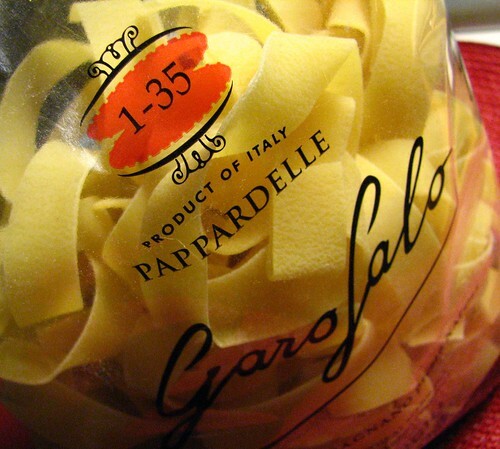 I love papperdelle, it’s one of my favorite pastas. This looks delicious. Just looking at the dish, one can see the luscious quality of the pasta. I’ve never tried this style of pasta – yeah, I know, I live on another planet – I really must try it. This papperdelle looks perfect – delicious recipe! Mama Mia, That looks good!! I’ll have to search out that pasta. Papperdele is my fav. I would love to try the one shaped like calamari. Sausage Ragu. Now there’s a dish that is not championed enough in my opinion…nice work. Looks good! The pasta looks great. To bad blogs aren’t scratch and sniff. Someday they will be. I like the plate best. Spode? Do you ever watch for bees? I’m running an informal survey at my blog on bees. I totally agree about the cooking times – I never, ever cook pasta for how long it says on the package. This ragu looks great. My mom was from Sicily and they put peas in a lot of their dishes. I am a total garofalo devotee….vincenzo goes all funny if I buy anything else. They seem a pretty big operation in italy, its available in most of the big supermarkets BUT it is just great and is in a different league from all the other big brands and many of the so called ‘special’ pastas. It’s the texture, it cooks really well and holds its shape even when you commit crimes against pasta by leaving it a minute longer than your pasta fanatic sicilian likes. ps the “spaghetti alla chitarra” is fab. I would try this brand off your recommendation. The ragu looks heavenly. No kissing bum! Amy… this is my mom’s favorite dish in the universe and she’s moving out to MI from NYC soon and now I can make this for her and help to cheer her up! It looks wonderful… thank you, thank you, thank you. And we have Garofalo pasta here. I really want to buy some of this. It says they sell it at Costco out west but I never renewed my membership last year. I’ll try to hunt it down somewhere else because I am all about quality pasta. I’ve spoiled myself on the packages from my Italian market, but they’re not quite perfect. Garofalo might be a good shot. And your dish does look fantastic! This papardelle looks incredibly good. Let me know if you can find it in Brooklyn anywhere, but the sausage ragu looks hearty, wintry and delicious. How do you get hooked up with all the freebies? That pasta looks fantastic! I went to a cooking improv out Brooklyn last night where each participant brought a mystery bag of ingredients. Someone brought a handful of fresh black truffles and another person brought a bag of semolina so we ended up making papparadelle which was pretty tasty. You guys are at the top of my list of people to invite if there’s room at the next one. Papardelle is one of my favourite pastas, it’s perfect for a ragu like this. You know what’s funny? I tried Garafolo pasta once – and I used it to make a pasta recipe I found on this blog. With a name like Garafolo, I kept expecting it to make witty, sarcastic remarks about g.W. Bush at me while I cooked it. 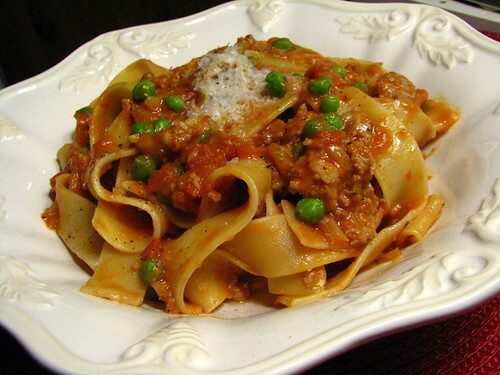 I love your ragu, although I’d have to make it without the evil peas. I too was contacted by Garafalo (but was a way bad blogger and never wrote a review) and here I’m thinking they’ll send me, like a sample….instead I got five pounds. Knock me over, why don’t you? It was as awesome as you describe. I could have never adequately expressed to my readers how good and perfect it was so I’m glad someone else gave them the deserved kudos. delighted you’re getting some free swag that’s actually good. More free pasta samples would solve world peace. The pasta looks really good. I love the different shapes. I would love to try them but I highly doubt I could find them in Arizona. I’m hoping to find them at a store near me, but unfortunately i need to go out of my neighborhood to get some. I’m on the lookout though! Not only is Garolfalo excellent stuff, but their whole wheat line is the only whole wheat pasta I have tried that is any good at all. Even the De Cecco is a little crude and one-dimensional in contrast, and of the various Barilla whole-grain lines the less said the better. I actually prefer Garofalo’s whole wheat long cuts to their regular (the whole wheat short cuts like the farfalle and fusilli are good but of rather pronounced flovor and will overpower some sauces). This pasta has always looked so fun and hard to eat. Big ‘ol flat noodles. It’s the kind of thing we have to eat at home, so no one will see us looking like piggies! This is a dish that requires you to dig in. We’ve got our forks ready! Hi Amy. I’ve been craving to prepare a tagliatelle dish for some time now but haven’t since it typically is made fresh and not available in the supermarket pasta aisle. What I do run to often though is dried pappardelle. I was considering substituting it for fresh tagliatelle. However, after seeing this recipe, I’ll just dump that idea all together and prepare this delicious-looking dish. Yum! This seriously looks like the perfect meal – you’ve got just about every food group, not to mention that I’m seriously biased because I love pappardelle. I think pasta with a good meat sauce is the perfect meal – add a salad and you have a hearty, healthy dinner! Pappardelle is my favorite pasta shape. You really feel like you’re getting a mouthful when you dig into a plate of that, especially with a meaty ragu. This is one of my all-time favorite comfort foods. I am also a fan of the alternative pasta shapes. If I spoke Italian I’d prolly make up all kinds of shapes and give them descriptive names to sound more authentic. Glad you’re getting free swag. Wish they would send me some! Very nice. Nice you say? OK, way beyond nice. That ragu looks slurp-worthy. I love this pasta. The whole wheat line is tasty and its budget friendly. Its the only one I bother with now. ( Its hard to find a whole wheat pasta the younger kids like the texture of.) This sausage and pea ragu recipe is very much right up my alley. Thank you. can I ask if anyone else wonders why “schiaffoni” (one of the other unusual shaped pastas available from Garofalo) appears to translate as “a little slap in the face”? they’re short pasta tubes…! any italian speakers out there care to help? I agree, Garofalo pasta rules! What a beautiful dish! 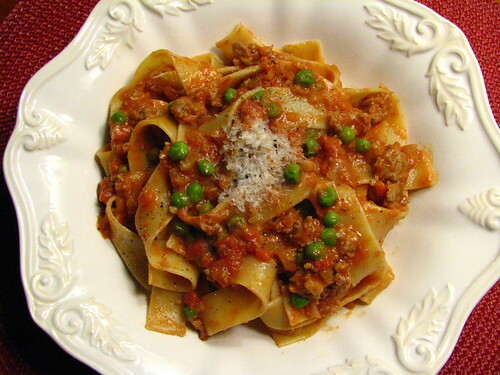 I am such a huge fan of good pappardelle (and actually, of ragu as well come to think of it). I’ll have to give it a try if I ever see it in the store. Thanks so much for visiting my blog, I’ll have to pour over your archives to uncover the secrets of Brooklyn food shopping! Thank you for stopping by, and please come again. I’m glad to have met–you site looks delicious, right up my alley, including this pappardelle recipe. That pasta looks really good! Looks absolutely mouth-watering! THe sauce looks and sounds really delicious! You guys are total whores. I would like to sign up to be a whore also, and receive delicious samples of fancy foodstuffs. Is there like a form you fill out or something? I would love to try this pasta. Spaghetti and meatballs is a staple at our house every Sunday. Sometimes I skip the meatballs and make some sort of meat sauce, your ragu sounds wonderful! peter: thanks for outing us as whores. you met us. you know we’re whores. both of us. i really would have preferred you kept this to yourself. but if you would like to be a whore as well, i’m actually not sure what to do. we didn’t sign up for anything. i still think it started when we got our own domain name, but others w/o their own get free stuff. i have no clue! but you can be another kind of whore if you really want. Wow, I love your al dente pasta instructions. I will have to employ this -2min technique and also try cooking pappardelle more often! This recipe is going in my “to try” file! I am so happy when I find a good pasta. I make my own often, but finding a good one and eating it al dente is a treat. I always believe pasta should be the star. And, then when I see peas, I’m in heaven. That is a lovely dish and I love the serving bowl. This is my favorite mass market dried pasta brand along with De Cecco. I never heard of it until I moved to Rome. Whenever it’s on sale I buy several bags of different pastas. I just had some of the mezza rigatoni today with a simple homemade sauce. I love papparedelle. It’s my favorite type of pasta!